This metal wind spinner has the theme of Crescent Moon blades. The blade shaped Crescent Moons are positioned so the wheels will spin in opposite directions once caught in the wind. This yard wind spinner includes a pole and it is made of sturdy metal with a light green rusty patina. This kinetic wind sculpture swivels 360 degrees in the wind. The total height is 5 ft tall and the width is 14 Inches across. 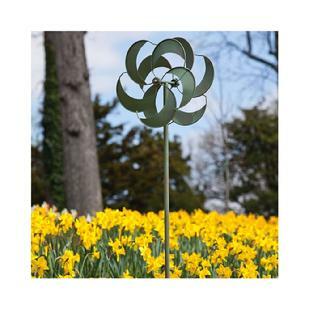 With its heavy duty construction and swiveling head, this kinetic wind sculpture can withstand strong winds up to 50 mph. The sculpture a will age naturally. You can preserve its original metal shine by spraying a layer of clear coat on it. The craftsmanship on this kinetic garden art is impeccable. The wheels are finely balanced and maintenance free. This kinetic wind art is entirely weather proof and made to last. Kinetic Wind Spinner $129 Free Shipping! Color Selection "Kinetic Wind Spinner"
It has a light green rusty patina!